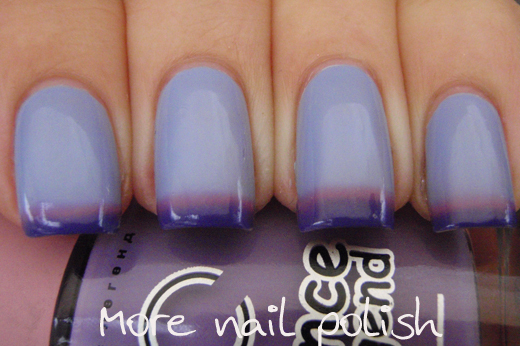 Tonight I have a couple of polishes to show you from Russian brand Dance Legend. These two polishes are from the TermoTrio collection, which are thermal colour changing polishes, but instead of changing to the normal two colours, these can shift through three colours depending on the temperature. I'm a complete sucker for any sort of gimmicky polish, whether it be magnetic, solar colour changing, glow in the dark, you name it, if it's a little bit different I'm gonna love it. The advertising bottle shots of these polishes look amazing, with three very clear colours showing in the bottle and the matching swatches also looked pretty amazing with the three colours showing all in one mani. What I was dying to see, was if the polishes would work like that on my nails, or if it was a set up for their camera shoot. TermoTrio No 1. The warm colour is light blue, the middle colour is pink and the cold colour is purple. Yes it really does show all three colours. To get this effect all I did was walk outside. My hands were nice and warm and my nails were all pale blue, then I went outside into Canberra's very cold morning and instantly the tips of my nails started changing. First the tips went pink, then the very tips went purple. You can see on my ring finger that my nail bed isn't as long as on my other fingers, therefore it is showing a wider dark purple band because I have a longer free edge there. This photo shows when I first went outside, with just the light blue and the start of the pink showing. Here my hands were warm, and the photo was taken indoors. These last two photos were taken after I had been outside for a bit and waved my hands around in the cold air. My full nail went almost a dark pink and the tips and indigo purple. This polish truly is a gradient in a bottle. Did you notice that the bottle colour changed too after being outside for a while? It went from the pink middle colour to the dark purple. TermoTrio No 3. 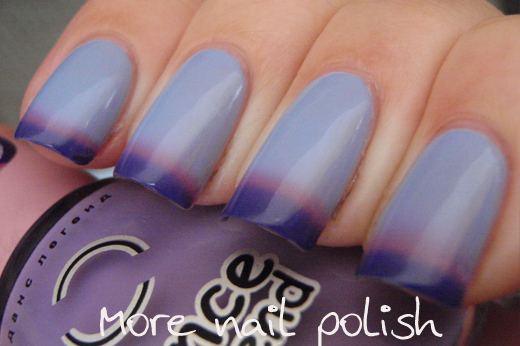 Just like the first polish, this one changes between three colours. The warm colour is a neutral grey, the middle colour is a dusty pink and the cold shade is a muted dark plum. The colours in this one are very wintry and chic to me. First up, warm hands just stepped out into the cold. The tips getting colder and turning the dark plum shade. After being outside for a while, the dusty pink shade crept up my nail more and more. The formula on both these polishes was excellent. Both polishes show two coats with Seche Vite Top Coat. 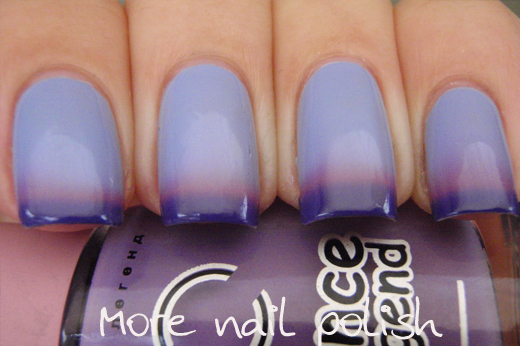 It can be a little odd painting you nails with colour changing polishes like these. My bottle colours were generally darker (because it's winter here) and when I painted them on my warm fingers, they changed colour immediately. This is very bizarre to watch happen, and the distraction can result in a slightly messier application. I love both these colour combinations, like I already said the grey toned one seems very wintry to me, and the blue and purple one is more spring/summer. The TermoTrio polishes are $13 USD and are available directly from the Dance Legend website. Dance Legend offer international shipping for a $10 flat rate, or free if you order more than 10 bottles. Wow - now I'm a sucker for mood rings and the like but these are way beyond that. I wouldn't be able to stop looking at my hands. Such pretty transitions! Fantastic colours too! Love the review and swatches! Wow, how interesting! I actually haven't seen thermal polishes with more than two colours before and I must say it's awesome. These will be perfect for Canadian winter! That's seriously cool; I really love that first one! Wow!! That's so cool! I've never seen one change into 3 colors like that before! I love the purple one. OMG those polishes are awesome! I must check them out! I'm a sucker for these sorts of polishes too! One small advice: try to use as much of the bottle in the nearest future as possible. The color changing formula is not very stable - in 4-6 months you may find that the polish does not change any more from light blue in No.1 (or grey in No.3). 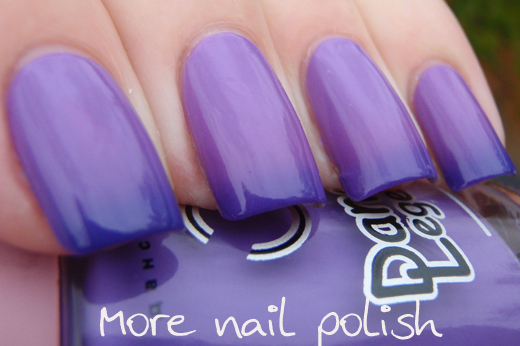 I think Dance Legend polishes are amazing - they are a great product from Russia. Thank you for the advice about the loss colour changing abilities after 6 months. Absolutely stunning! -Thanks for the advice, artavika!